Vadgam is fighting Vadnagar (home and constituency of Modi) is how he pitched it. The decision to contest the Gujarat Assembly election came very late from Jignesh Mevani. On November 27, in a Facebook post, he declared his intentions to contest as an independent candidate from Vadgam constituency in North Gujarat. Jignesh is from Mehsana and lives in Ahmedabad. That way he was an “outsider“ to Vadgam-11. But he was not unknown. The people of Vadgam, like the rest of Gujarat, recognised him as the young rebel leader who was catapulted to limelight after the Una struggle. Huge anger had outpoured in July 2016, after the horrific video of four Dalit cattle-skinners being flogged openly went viral. 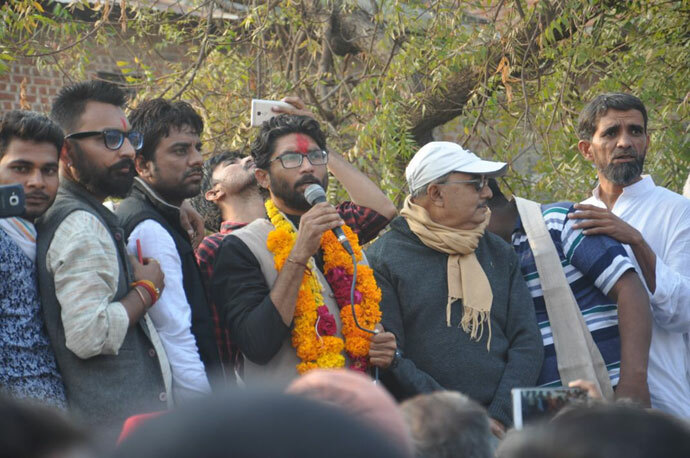 A lawyer and journalist, Mevani creatively articulated the demands of the Una struggle and broadened its agenda to highlight on the question of land alienation among Dalits in Gujarat. Since then, Mevani had been relentless. He protested against Modi’s “Vibrant Gujarat Summit” in January 2017 and led a pulsating Azaadi Kooch (“Freedom March”), demanding land distribution for Dalits, in August 2017. The Azaadi Kooch ended in Lavara Village, Banaskantha, near Vadgam, where seven Dalit families were given actual possession of land, which was pending in papers for almost 50 years. Mevani has been vocal about minority witch-hunting, communal politics of the BJP and kept attacking the “Gujarat model of development”. In the age of digital and social media, stories of his struggles travelled far and wide. Thus, when he decided to set foot in the electoral battleground, he was not unknown in Vadgam-11. But then again, one cannot win elections, especially in rural constituencies like Vadgam, by only being famous. The game was especially tough for Jignesh, because he was fighting on an independent symbol: a sewing machine, which he chose because he wanted to “mend the vikas (development) which is in tatters”. Also, he consciously chose a symbol with which women would identify more. This was not the traditional symbol of Congress’ hand, which the people of Vadgam have voted in majority for decades. Although the Congress and Aam Aadmi Party (AAP) pledged their support to Mevani and did not field any candidate against him, his fight was not easy. The BJP saw this as an opportunity to wrest a traditional Congress seat and mobilised maximum resources for this seat. Ashwin Parmar, the son of Daulat Parmar, an earlier MLA of Vadgam, staked his claim, too, and spread the rumour that he is the “real Congress-backed candidate”; even the BSP refused to cooperate with Jignesh and filed its own candidate. With no party structure in place and no resources, Jignesh still went ahead with the elections, with very little time at hand. He gave a call to his friends, comrades, sympathisers and well-wishers spread across the country to stand by him. This was a unique model of fighting elections, against the BJP, that too in their home turf, Gujarat. Jignesh’s election soon, however, turned into a political campaign against the BJP government in the state and at the Centre — in short, against fascism. Activists from across the country started gathering in Vadgam. In Delhi and Mumbai, too, co-ordinations were set up for social media and media propaganda. Most importantly, Crowdnewsing, a crowd funding enterprise, pitched in to collect funds. “Janta ki ladai, jantaa ke paison se (people’s struggle with people’s funds)” was how it was framed. Funds started pouring in from everywhere. The amounts varied; donations were drawn in an incredible range: while writer and activist Arundhati Roy contributed a massive Rs 3 lakh for his campaign, a school student from Kanpur chipped in Rs 20. In less than a month, 522 contributors gathered more than Rs 18 lakh. Is that enough to contest an Assembly election in India? Officially yes, but unofficially, no. Everyone knows how votes are purchased and money is laundered during polls. But Jignesh and his campaign team were clear on that. No money will be distributed, no votes will be purchased. Despite few days in hand, Jignesh and his campaign team decided to go to the masses, to reach out to every household, through door-to-door campaign, small village level meetings, processions and road shows. That required humongous human effort, challenging the established thekedaari system of votes, where agents of every community are bought over who in turn ensures votes from their respective network. A motley group of activists, from Delhi, Mumbai, Karnataka, Punjab, Kerala and other places, gathered at a guest house called One Ten in Kanodar, Vadgam. A group of young filmmakers led by documentary filmmaker Nakul Singh Sawhney set up a bastion, which was responsible for constant digital streaming of his every meeting and road show, along with designing videos and photos for social media circulation. Creativity fashioned his unique campaign and in no time, Jignesh Mevani’s face — along with the symbol — started appearing in the most remote corners of his constituency. Voters started putting up his stickers on their mobile phones, shops, doors and vehicles. Most importantly, what spread was the idea that a person who has emerged from ground-level struggles is going to represent Vadgam’s people in the Assembly. That really caught voters’ imagination. In every fiery speech, Jignesh took the BJP government head on. He harped on the importance of forging unity among the oppressed masses to fight the authoritarian regime, which is turning fascist now and clamping down on every democratic space and constitutional values. Vadgam is fighting Vadnagar (home and constituency of Modi) is how he pitched it. The crowds kept swelling in his meetings and road shows. Towards the end, the participation of women became particularly spectacular. It is not that he did not face opposition. Jignesh Mevani faced bitter, stiff opposition from the BJP. They unleashed Vijay Rupani, Yogi Adityanath, Amit Shah and none other than Narendra Modi to campaign in and around his constituency. On December 5, his convoy was attacked not once but four times. In Takarwada village, dominated by the Chowdhuri community, people blocked his convoy and chanted Modi’s name and stoned his car to intimidate him. In the sole press conference that Amit Shah addressed before the election, he dedicated a full ten minutes to slander Jignesh, trying to establish his fictitious connection with “jihadis” and “Islamic terrorists”, all because Jignesh received a donation of Rs 50,000 from a legal organisation called SDPI, in cheque! Just before elections, posters appeared in Muslim-dominated villages assassinating his character, while the ones in Hindu-dominated ones harped on how Jignesh Mevani is an Islam apologist. But all that could not outmatch the support he received. While travelling back to Delhi, on my way to Palanpur to catch a train, our driver Irfan bhai a septuagenarian Muslim man said, “Never in my life, I have seen an election like this, with so much enthusiasm and energy.” That was our challenge — to turn this sold out, degenerate process of elections, into a carnival of the masses. On the last day of his campaign, in the final road show, hundreds of bikes and cars, tempo and auto-rickshaws, joined overriding our estimate. We don’t know, who all participated, but post the result and Jignesh winning by a thumping margin of 20,000 votes, we know one thing for sure: in the battered countryside reeling in crisis, in the face of fascism staring at our faces, it is possible to change the grammar of electoral politics. Yes, BJP has managed a slender victory overall in Gujarat, but with Jignesh’s victory, a small spark of hope has been generated with immense possibilities. That will be BJP’s major worry. And therein lies our actual victory. An independent researcher, freelancer and lecturer of Sociology in DU. Member of Jignesh’s campaign team.